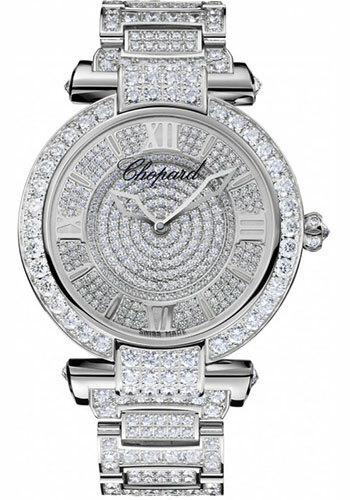 40mm 18K white gold case, sapphire back, inverted diamonds end pieces, 18K white gold crown, diamond bezel, diamonds set dial, Chopard 01.03-C automatic movement, approximately 60 hours of power reserve, 18K white gold bracelet with diamonds, 18K white gold folding buckle. Water resistant to 50 meters. 40mm 18K white gold case, inverted diamonds end pieces, 18K white gold crown, diamond bezel, diamonds set dial, automatic movement, approximately 60 hours of power reserve, black alligator strap, 18K white gold pin buckle. Water resistant to 50 meters.